For survivors of the zombie apocalypse, hopes are not lifting. As others try to keep their mind on practicalities, former policeman Rick Grimes seems increasingly on edge. As his behavior grows more and more conspicuously eccentric, other group members worry that he is putting them all in mortal danger. 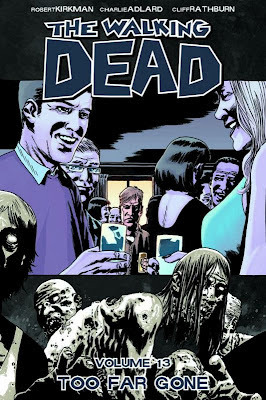 The thirteenth volume of The Walking Dead includes issues 73-78 and shows that even after finding a secure refuge, the survivors of this zombie apocalypse still have much to fear. Rick is pretty much a police officer again. When he notices domestic violence going on in one of the houses, he can't stop himself from doing something about it. Which includes reverting back to the out of control animal he became while trying to survive in the zombie wasteland. Not to mention that another pack of desperate--and idiotic, imo--men have targeted the safe haven and are prepared to take it by force. The problems never stop coming. I'm really liking the fact that although all of them want to desperately fit in and get back into some semblance of a law-abiding society, there's just no way to hide who they've become. Or a real chance to forget what is still roaming outside the gates.